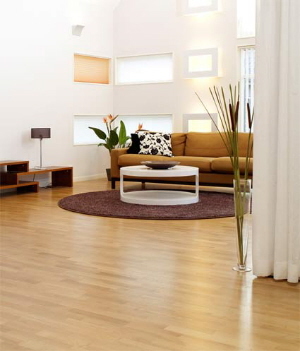 Bona Pacific strong  A two-component waterborne urethane wood floor finish formulated for interior use on high traffic residential and commercial wood floors. The original worldwide standard for waterborne finishes. Ingredients: Water, polyurethane/acrylic polymer dispersions, Diethylene Glycol Monomethyl Ether, N-Methyl-2-Pyrrolidone, defoaming and leveling additives. Color - Milky white (wet) Gloss Level - (60°) >85 for gloss, 55 for silkmat pH - 8.0 Odor - Non-offending Solids - 34% Flash Point - > 200° F Viscosity - (#4 Ford cup @ 25°C) 16 seconds Stability - 1 year shelf life Density - 8.68 lbs./gallon (1.04 S.G.) VOC - Does not exceed 350 grams per liter (2.9 lbs. per gallon VOC) Packaging - 1-gallon plastic bottle  Comes complete with crosslinker Application Characteristics: Clarity - Clear when dry Coverage - 500-600 square feet per gallon Leveling - Excellent Percent Cured After 24 Hours - 70% Defoaming - Excellent Maximum Cure - 100% after 1 week Drying Time - 1-2 hours Pot Life - The finish/crosslinker mixture is active for 8 hours after it is mixed. Within 2-3 days, crosslinker may be added one additional time. 1. Be sure floor is free from wax or oily residue. 2. Use Bona Prep system (see label for directions). 3. Apply 1-2 coats of Bona Strong (see finish directions). If Recoating a Factory Prefinished Floor, use the Bona Prep system. Follow the label instructions for Bona Prep, using only Bona Traffic or Bona Strong finishes. Delamination can occur if the Bona Prep process is not followed and the floor has not been tested for compatibility. NOTE: Bona Strong will adhere to most stains and finishes after proper preparation and dry times. ALWAYS PREPARE A SAMPLE OR TEST AREA TO DETERMINE COMPATIBILITY. SANDING AND FINISHING NEW FLOORS 1. Sand and prepare floor using NOFMA-accepted methods. 2. For a stained floor, make your final cut with 80-grit paper and screen with 80 - 100-grit screen. Apply Bona® DriFast Stain. For an unstained floor, make your final cut with 80 - 100-grit paper and disc/screen to 120 - 150-grit. This burnishing will reduce the amount of grain raise. 3. Use Tampico Brush on buffer and vacuum thoroughly. 4. Tack with a dry Bona® microfiber mop or cloth. 5. Apply sealer and finish system (see finish directions). 1 coat of BONASEAL® - THE USE OF BONASEAL® MINIMIZES THE POSSIBILITY OF SIDEBONDING  2 coats of Bona Strong. Adding a third coat of finish is recommended in high traffic commercial and residential areas. Abrading between sealer or finish coats is not necessary for adhesion unless it has been more than 48 hours since the previous coat has been applied. However, for smoothest floor results, abrade the sealer coat with a Bona® Conditioning Pad and two siafast Delta Sheets. The Delta Sheets are to be used for abrading Bonaseal® only. Prior to applying the final finish coat, abrade with just the Bona® Conditioning Pad. Always thoroughly vacuum and tack with a slightly water-dampened Bona® microfiber mop or cloth after abrading. SHAKE WELL BEFORE USING. 1. Open the crosslinker bottle and add an equal part of water to the crosslinker. Shake well. Add the crosslinker/water mixture to Bona Strong within 15 minutes. Shake or stir and let sit 5-10 minutes. 2. Pour a 4" wide line of finish along the starting wall. Go with the grain of the wood. 3. Using a clean, pre-dampened applicator, draw the applicator forward, with the grain of the wood, moving the finish toward the opposite wall. Holding the applicator at a "snowplow" angle will maintain a wet edge at all times. 4. At the end of each run, turn the applicator toward you and pad out the applicator parallel to the wet edge. 5. Feather out all turns. If pushed too hard or too fast, drips will fly off the applicator. 6. Missed areas can be touched up if seen right away. 7. To prevent lapping and dry marks, be sure you are using the recommended coverage of 500-600 sq. ft. per gallon. Be careful not to spread the finish too thin. 8. Allow your first coat to dry 1-2 hours. High humidity and/or low temperature conditions will extend dry time while increased ventilation and airflow will reduce dry time (recommended conditions of 65-80°F/40-60% relative humidity). For smoothest results, abrade with a Bona® Conditioning Pad before applying final coat. Always vacuum and tack thoroughly with a slightly water-dampened Bona® microfiber mop or cloth before applying final coat. Allow final coat to dry at least 48 hours before use. The curing process takes approximately 7 days. Do not replace area rugs until the floor has fully cured. The floor may be walked on after 24 hours, but the floor is susceptible to scuffing or marring prior to completion of the curing time. Use only a dry Bona® microfiber mop or cloth for cleaning during the first week. Put walk-off mats at all entrance doorways to keep out excessive dirt and grit. 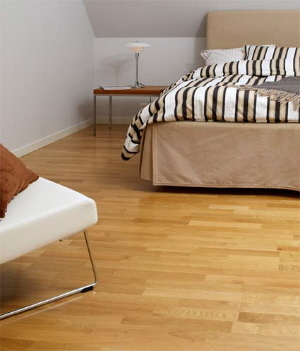 Sweep or vacuum daily and damp-wipe as needed with Bona® Swedish Formula® Hardwood Floor Cleaner.